I am looking into all the ways to have fun on a bike. I want to improve my balance, confidence, physical poise, and body sense in general and specifically on a bicycle. All my life, playing around on bikes has always looked like the most fun anybody was having in normal life. Putting the Boulevard Cyclocross Clinic on the calendar seemed like the most natural and unnatural thing in the world, at the same time. N. went too, a cycling adventure not yet checked off his list. "I'm kind of really scared," I told him in the parking lot. Cyclists in team kits were whizzing around. Orange cones were festooned around the grass of the park. N. would rather I were cool and fearless. Fear is friction, a drag force. He makes a face. "It's just a field," he says. N. has been riding a bike since he could walk. Also, he has the build and balance and freaky binocular vision of a feral cat. "Yeah," I say and make a face back and laugh at the whole thing. Falling is not scary. Sucking is not scary. My body being unpredictable, not being able to tell what it's about to do in space, is very scary to me. But so what. Scary is something to move alongside, not something to run from. We listen to a primer on cross bikes, wheels, and tires. Expensive featherweight Zipp wheels are passed around for us to ogle and covet. The beginners follow Theresa and Mark down the hill and behind a huge sand berm where cones are laid out in a big circle on the grass. In two groups of about twelve riders, we practice dismounts and mounts. Drills: Get some momentum, stand on the left pedal, clip out of the right, then move the right leg over the bike behind the left, then back again. Pedal and repeat. Touch your foot to the ground. Push off with your foot a few times, then swing your leg back over. 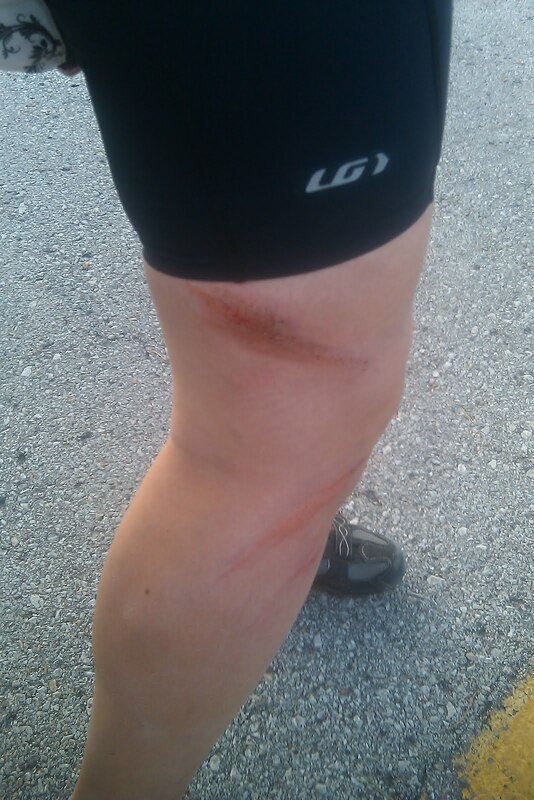 This is what a human leg looks like after multiple contacts with a rotating tire. Apparently I have no idea how wide my pelvis is or how far I have to move my hips or even where my tire is located. Things To Learn And Practice. Strangely, it was easier to do the full dismount than to ride standing on one pedal. I am just very glad I didn't rip up my only pair of tri shorts. Our teachers said mounting — jumping on the moving bike — would be harder but I didn't find it so, perhaps because at low speeds it did not involve continuous abrasion. I've been practicing throwing a leg onto the saddle and over and finding the pedals since last winter. Here my wide, flexible hip and cushy thigh is perhaps less of a liability. Finally, we rode the orange cone line snaking around the park. Riding around twisty grassy stuff as fast as you can is a lot of fun. Kid stuff. And who couldn't use more kid stuff? At one point about six of the experienced cross racers swooped from behind and rode all around me then blew past on a curve. Blur of team kits and bikes! Grass and dirt under tires! Cool! Back next week for the women-only night. Looking forward to it (and to some public park dismount practice in the meantime). Oh, and... N. of course was brilliant. Looked like he had been riding cross for years. He probably could have ridden one of these and made it work.